In 1599, Henry Buttes wrote a slightly comical cookbook for the Bacon family to raise funds for the construction of a church. For the first time in modern history, you may review Buttes’ eight course feast based on the Elizabethan humours, edited for the modern kitchen. Original recipes, commentary on the medieval humours of each main ingredient, stories to amuse a Tudor noble, and explanations of Buttes’ dry witticisms (plus a comprehensive glossary) make this book both the resource and discussion piece of your explorations into Tudor cuisine. For those who like to experiment with cooking and want to have some historical fun playing in the kitchen or at the campfire, this book is for you. This ambitious book is the result of extensive research by Michelle Enzinas. Michelle has spent 15 years as an historical re-enactor and amateur domestic technologies archaeologist, and 20 years dealing with food allergies and research into food security issues. An avid wrestler, she claims much of her cooking is an extension of her interest in self-defense. Previously Michelle has self-published a medieval cookbook, as well as a series of cooking columns in historical re-enactment journals and newsletters. She has a bachelor of science in psychology from Acadia University. Michelle lives in Ottawa, Ontario, where her experimental cooking is enjoyed by her husband, and eyed suspiciously by her daughter. Imagine you are an Elizabethan gentlewoman with a taste for good living and a certain amount of pride in how well you run your household and especially your kitchen. One of your favorite past-times is sitting with like-minded friends sampling the latest fashionable dishes and discussing healthy eating. If you are that lady – or a similarly inclined gentleman – Henry Buttes, the scholar-gourmet, might be a regular visitor to your table, and you might sit at his occasionally, to hear him hold forth on both the lore of food and its proper presentation. Henry Buttes is long dead but it is still possible to enjoy his company, thanks to Michelle Enzinas’s Big Buttes Book, an annotated edition of Henry’s learned commentary on an ideal, healthy dinner amplified by appropriate recipes taken from a variety of Elizabethan sources. Big Buttes Book serves a double audience: first, people interested in the classical/medieval/renaissance tradition of cooking and eating; second, those who want an approachable introduction to what gentlefolk actually ate. Those who come to this book from either direction may surprise themselves by finding that the other approach is more interesting than they would ever have guessed. The scholarly audience will be pleased with how Enzinas has made the Elizabethan theory of the humours come to life in actual edible dishes. 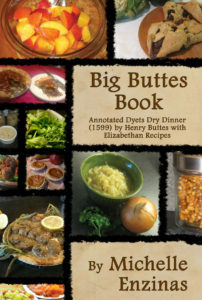 Those who at first look at the Big Buttes Book primarily as a cookbook, will find themselves being drawn into Henry’s discussion of the logical foundations of cooking, and will learn much about how individual dishes were combined into a proper Elizabethan meal. This Five Rivers Publishing production is attractively put together. The many colour pictures of delicious food adds a lot to the presentation. Big Buttes Book: Annotated Dyets Dry Dinner (1599), by Henry Buttes, with Elizabethan Recipes, by Michelle Enzinas releases February 1, 2017 in a 7″x10″ full colour, hardcover, as well as eBook with full colour images.